I recently posted this video to our Geeks on Tour Youtube channel and I figured our blog readers may like to see it too. 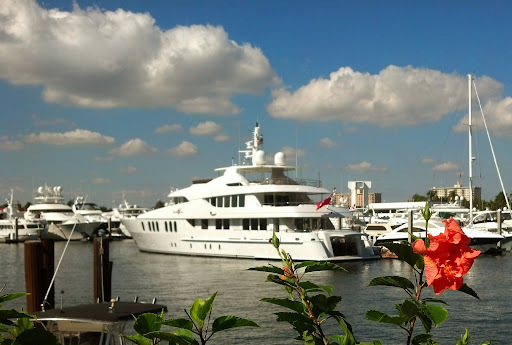 Fort Lauderdale, Florida is where we call home. My grandparents moved here in the 1950s. I lived here when I was 2, then Mom met my stepdad and he moved us to Seattle, Washington then Alaska. That’s one way to avoid the in-laws! We moved back here when I was in high school, then I took off for parts unknown and didn’t return till I was 30. That was 1983. Jim has lived in Fort Lauderdale since the 80s as well. We hit the road in 2004, but the glorious winter weather, the scuba diving, and lots of family and friends keep us coming back here and we still call it home. One day this week was so drop-dead gorgeous that I just had to get out on the water. 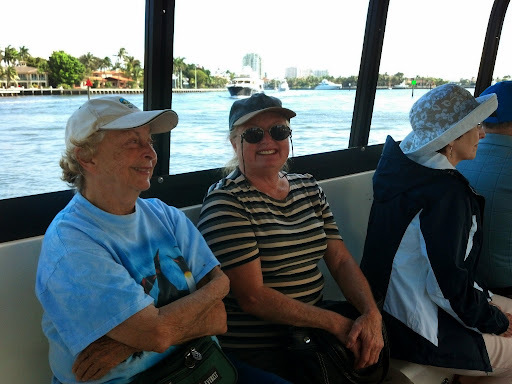 So, I grabbed Mom from her assisted living place, and my friend Dee, and we hitched a ride on a water taxi. This picture was taken just about at the point in the New River where my grandparents lived. I can’t figure out what property was theirs now because all the old homes have been torn down and mansions built in their place. Within an hour of dropping Mom back off at home, you could ask her what she did today and she’d tell you … oh nothing. 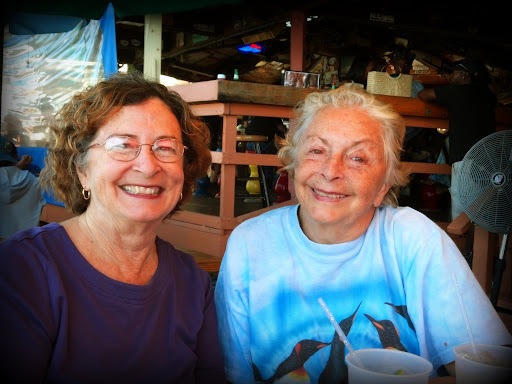 “Didn’t you go for a water taxi ride with Chris today?” “No, I haven’t seen Chris in a long time.” Alzheimers has taken away her ability to remember anything from minute to minute. But, she sure looks happy here doesn’t she? I’m afraid I can’t say the same for Jim’s Dad. He doesn’t get out of bed any more, and he has 24 hour Hospice care. All we can do is visit, hold his hand and tell him we love him. 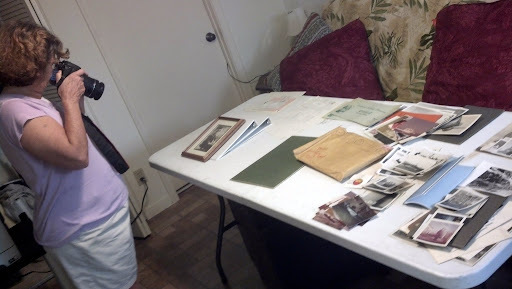 We did get together with Jim’s sister and look at some old pictures. Here’s a great one of him pumping gas at his Texaco station in 1966. We looked at a lot of old pictures, and I spent some time taking pictures of them. We like this way of capturing old photos rather than scanning them. It’s a lot easier, quicker, and just as good or better quality. We’ll be doing a day long seminar for a genealogy group in the Orlando area. We’re preparing. Our reason for coming to town was to do a Smartphone seminar for a computer user group at the community of Bellaggio. This is the second time we’ve been invited to speak here and it went very well. Someone there snapped this photo of us and sent it to us. Thanks! Today we’re taking off again and are headed to Orlando Thousand Trails park. We are booked to present our seminars at several clubs in the Orlando / Tampa / Port Charlotte area. Then we’ll be back in Fort Lauderdale again on Feb 18. See our calendar for more details. Does anyone else out there beat themselves us for being lazy? I know I do. If you look at my blog, you will surely see lots of places where I work hard … but there’s plenty more where I don’t – I just don’t write about them! This week was a relaxing week. We’ve been at the Peace River Thousand Trails park and the highlight of each day has been taking a walk on the nature trail. I’m afraid Odie might not be with us too much longer … he’s coming up on his 15th birthday, and he has several health issues. But, so far, he is still doing his job of getting us out for at least a calm stroll every day. We did teach a couple of classes this week, and we took advantage of the small relaxed groups to put together two new titles: Using Movie Maker, and Smartphone Photography. Is it just me or has the world of personal technology taken unprecedented leaps and bounds just this past year? Maybe that’s part of why we’re feeling tired. Last summer, we presented 8 or 9 different seminars at the big rallies. This summer, I think we could do 8 or 9 new topics with no problem. Another reason we like this park is that it has a nice hot tub. We took advantage of that a couple times this week. aaaaaaahhhhhhhhhh Jim took off on Thursday and visited the Tampa RV Supershow. I said I wanted to stay home because I had so much computer work to do. I sat at the computer much of the day, but I wouldn’t call it work. Actually most of it was learning … in preparation for our Smartphone photography class the next day, I just read up on everything I could find on different smartphone cameras and the best techniques for using them. Back Up to the Bar! We are in Sarasota because we’re presenting a Cloud Computing seminar to the Sarasota PC User Group tonight. When I consulted my AllStays Camp & RV app on my Droid smartphone, I noticed an Elks lodge with RV parking just about a mile away from our seminar location! Cool. Staying at Elks’ Lodges is fun because you have a restaurant and bar right next to you. This one is cooler yet in that there is a Tiki Bar – and that’s right where the RV parking spots are! Unfortunately it’s only open on Fridays and we’ll be leaving on Thursday. We’re also just a few miles from what is touted as the Best Beach in the Nation. We got parked about 4:30, so we took a drive to the beach for sunset. I’m so glad we did! Happy Birthday Jim! This sunset is just for you! We weren't the only ones enjoying the sunset. Cool spot. When we got home, we shuffled over to the main bar and had a delicious dinner at the Elks lodge. Unfortunately, they were out of birthday cake! We had to settle for cheesecake. We learned that the main kitchen guy just had a baby the day before. We also met John and Jim, long time Sarasota Elks Lodge members. It’s always a party when you stay at the Elks. A couple glasses of wine finished off our celebration, then we just walked around the corner to home. We’re hoping to have time before we leave on Thursday to visit the Ringling Circus Museum and Mansion too.